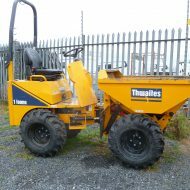 This dumper is the perfect compliment to the Micro Digger. A walk behind machine capable of carrying 500kg, it measures only 785mm (31“) wide yet can provide a tipping height of 1370mm (54“). Invaluable where space is at a premium. Capable of travelling over steep or uneven terrain.